Have content, will travel. Yes! We will come to you! Looking for an informative and engaging presentation on Florida bicycling? FBA is here to help. We offer signature presentations in addition to tailored content based on your needs. Complete Streets Savvy, or CSS, is a general bicycling education presentation. The purpose is to provide basic information with regards to the Florida Department of Transportation’s adoption of Complete Streets policy and how cyclists and motorists can share the road safely. This presentation runs 10 – 15 minutes and is designed for legislators, county or city elected officials, civic organizations and other entities that meet regularly and need informative content. There is no fee. Florida Bicycle Association will gladly give this presentation to anyone who asks. Is this what your next meeting needs for content? Click here to complete our CSS presentation request form. Educate Your Delegate – The 2019 session is just around the corner – now is the time to make contact with your elected official as part of our “Educate your Delegate” initiative. Not sure how the process works? Florida Bicycle Association is more than happy to provide you and your organization the fundamentals of working with elected officials to inform them of your concerns. This presentation runs 10 – 15 minutes and there is no fee. Send an email to Becky@floridabicycle.org or request a presentation by completing our online form. Need a specific bicycling education presentation? There’s no harm in asking, so ask away! Florida Bicycle Association will be happy to help as best we can to create and present an informative and engaging discussion. Send an email to Becky@floridabicycle.org or request a presentation by completing our online form. Do you have something to say? We Need You! 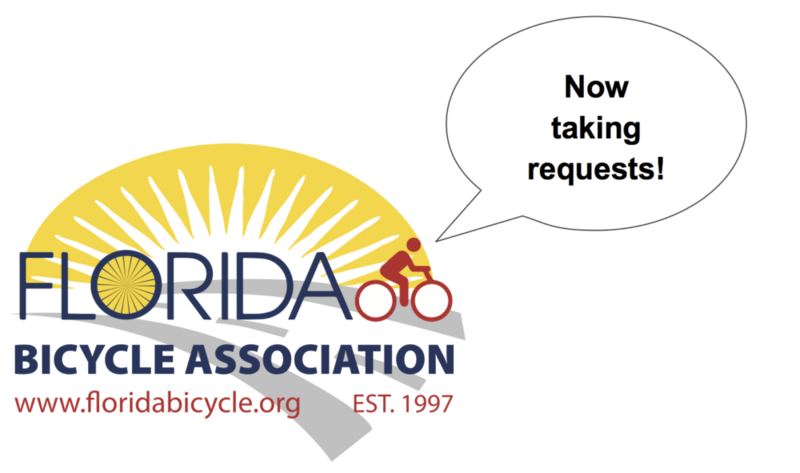 The Florida Bicycle Association is looking for members in good standing to volunteer to present our signature programs to their local legislators, county or city elected officials, civic organizations and other entities who meet regularly and need informative content. Outreach has no bounds. We believe networking beyond the cycling community will create connections and generate partnerships. FBA recognizes we could not do this important outreach without the assistance of our volunteer members. Do you have it in you to present on behalf of FBA? Please contact becky@floridabicycle.org for more information. Thank you for your interest in our educational outreach programs.